Injuries that result from workplace accidents can take a physical, emotional and financial toll on you and your loved ones. Time away from work due to a disability can lead to significant financial strain and uncertainty for your family’s future. To add insult to injury, insurance companies often seek any reason to deny, delay and devalue your case, no matter how severe your injuries may be. The Law Offices of Humberto Izquierdo, Jr., PC has earned a reputation for successfully representing injured and disabled clients in workers’ compensation claims throughout the Atlanta and Marietta areas of Georgia. To learn how we can help you obtain the justice you deserve, please contact us today online or at 770-888-8901 to schedule a free consultation with an experienced attorney. Why Should I Hire a Workers' Comp Lawyer? What Should I Do If I've Been Injured on the Job? My Work Comp Claim Was Denied – Now What? Workers’ compensation is a no-fault benefit mandated by state law. 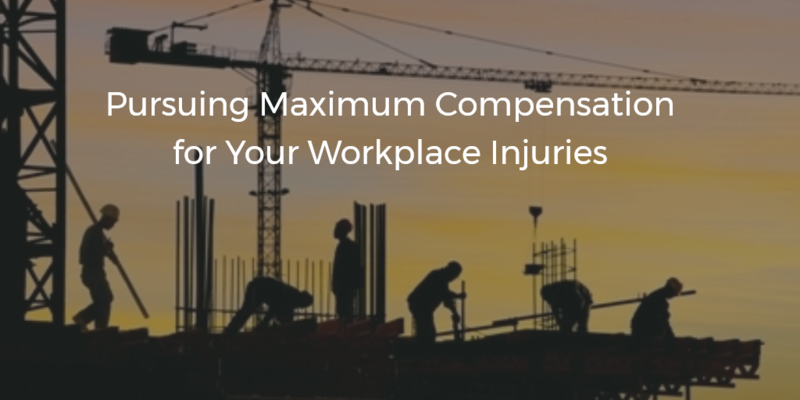 It provides a limited wage loss benefit for workers who are disabled as a result of a workplace injury. Every state has its own workers’ comp laws. Generally, if your employer has three or more employees and you suffered your injuries while performing duties that occurred during the course of your employment, you will be covered under Georgia workers’ compensation law. Medical Treatment: This covers all medical care recommended by your Authorized Treating Physician (ATP). Medical treatment may include medication, surgery and therapy. If your injury receives a “catastrophic” designation, you may be eligible to receive weekly compensation checks and medical care for life. Since the recommendation of your ATP is so influential in deciding the medical and financial future of your case, it is crucial that you never allow your employer or your employer’s insurance company to assign an ATP to you. Our attorneys can help. Permanent Partial Disability (PPD): These benefits help workers whose work-related injuries make it permanently impossible to perform their job duties. Benefits are generally based on reaching Maximum Medical Improvement (MMI) rating that range from zero to 100; zero signifying there is no disability and 100 designating permanent total disability. PPD is based on a formula that includes your percentage of impairment, the part of the body that is impaired and your compensation rate. Temporary Total Disability (TTD): In most cases, TTD benefits will provide an injured worker with two-thirds of his or her average weekly wage (AWW), calculated from a period of 13 weeks prior to the injury. Depending on your circumstances, you may still be eligible for TTD benefits even if you are able to return to light work duty or if your employer will not or cannot accept you back at work under the restrictions issued by the treating physician. Beyond establishing that you have an injury that qualifies for work comp benefits, you must prove that your injury actually occurred at work. This can be a highly complex task that requires the assistance of experienced legal counsel. Why Should You Hire a Worker’s Comp Lawyer? Deny: An insurer or adjuster may flatly deny your payment by claiming your injury was pre-existing or your medical treatment is not reasonably required and not appear likely to affect a cure, give relief, or restore the employee to suitable employment. Delay: Often times, an insurance company will drag its feet and put off paying you what you are entitled for as long as they can. Medical providers want to get paid. When the insurance company doesn’t cover your bills, hospitals turn to you for payment or the ATP will stop providing you with medical care. This causes delay in your recovery. Devalue: Insurance companies are in the business of making money, and rarely offer a settlement that is in the best interest of an injury victim. That’s why it’s important to have someone on your side who understands what your case is worth and won’t settle for an insufficient offer. The consequences of these actions can be alarming. The financial burden of mounting debt and time away from work can become too great to handle, and possibly lead to bankruptcy. Do not surrender your rights. While a workplace injury settlement may mean the world to you personally, insurance companies see you as just another number. 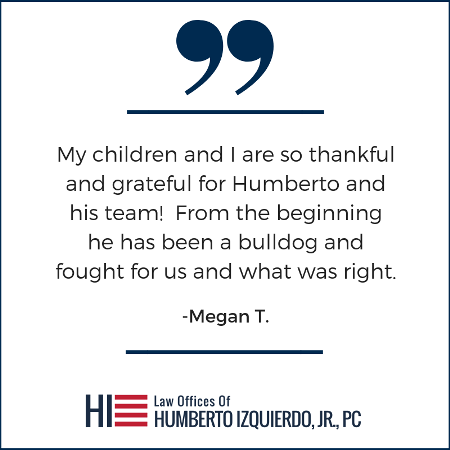 At the Law Offices of Humberto Izquierdo, Jr., PC, you are our top priority. 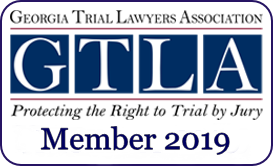 Having spent three years as an insurance defense litigator and as a current member of the Atlanta Bar Association’s Workers’ Compensation Section, Humberto Izquierdo is intimate with Georgia workers’ comp law and the tactics of insurance agencies. In addition to the skill and knowledge of our attorneys, we have earned the respect and reputation among adjusters as being aggressive but reasonable. This healthy working relationship will benefit your case. 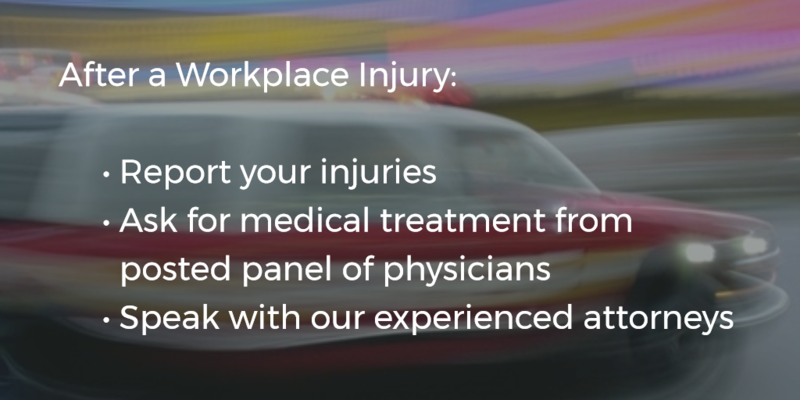 What Should I Do If I’ve Been Injured on the Job? Report your injuries to supervisor: There are some cases where supervisors have tried to talk an injured worker out of reporting an injury. This is illegal. If your employer is trying intimidate you into not reporting your claim or says it occurred outside of work, contact legal counsel immediately. Ask for medical treatment from your employer’s posted panel of physicians: Not only will a visit with a medical professional ensure you receive important medical care, it will document your injuries and necessary treatment. It is crucial that you ask for medical treatment from your employers posted panel of physicians. This panel of physicians should be posted in a noticeable location on the premises of your employer. Failure to seek treatment from the posted panel of physicians often results in the employer selecting the treating physician, which could potentially jeopardize your claim. Contact the Law Offices of Humberto Izquierdo, Jr., PC: By contacting us immediately, we are able to initiate your claim with the insurance company and with the state board of workers’ compensation. We can immediately advise you on your rights and necessary next steps. You have one year from the day of your injury to file a claim with the state board of workers’ compensation. Failure to meet the statute of limitations will destroy your case. It is critical to your claim that you hire an attorney quickly as possible. While a workplace accident can occur in any line of business, worker’s compensation cases are more frequent in blue collar professions. 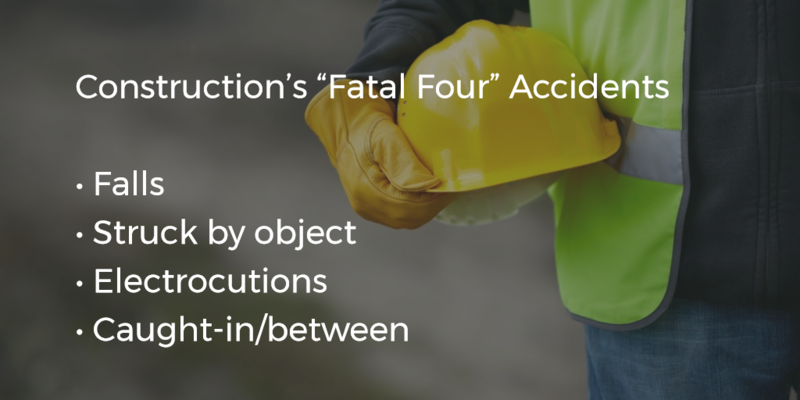 Below are some of the most common types of accidents we see at our firm. A construction site can harbor a number of potential safety hazards, including volatile chemicals, large machinery and power tools. Safety measures should be in place to protect workers from harm, but every year construction workers are injured or killed on the job. In its heyday, the stretch of carpet mills and floor covering outlets along I-75 between Atlanta and Chattanooga claimed to produce nearly half of the world’s carpets. While those golden days have diminished, carpet factory and other warehouse jobs still account for a substantial number of worker injuries. These jobs involve a variety of potentially dangerous roles, such as loaders, material movers and machinists. Many warehouse and factory-related injuries involve forklifts. Carpal tunnel syndrome is the most common of these conditions, but all can be difficult to prove since they develop over the course of several months or even years. An experienced attorney can help you navigate the complexities of these cases. There is never a guarantee that your claim will be accepted. The insurance company may decide that there isn’t enough evidence to back your claim or that it was the result of a preexisting condition rather than a workplace issue. 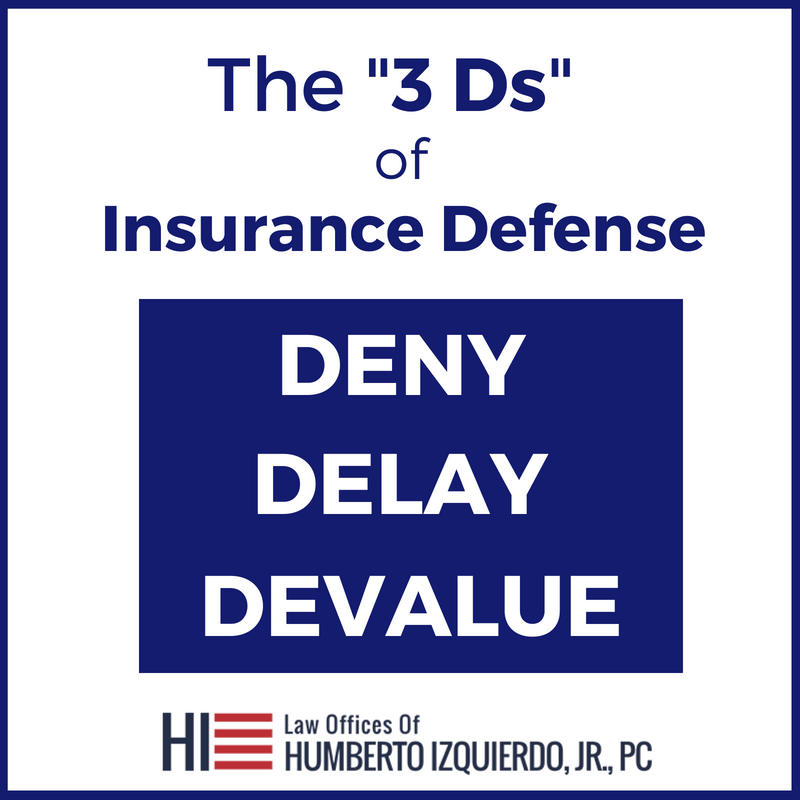 Humberto Izquierdo worked as an insurance defense litigator for three years, and understands the ways insurance companies try to deny, delay and devalue your case. If your work comp case was denied, the appeals process begins with a hearing scheduled within 30 days of the administrative law judge receiving your file. After hearing both sides of the case, an administrative law judge will either deny your claim or issue you an award. In some cases, you can continue to appeal even after your claim has been denied again.